Nobel Laureate Dr. Paul Krugman penned another winner for the New York Times this weekend, entitled Against Learned Helplessness. I understand helplessness, but it’s pretty arrogant for Krugman to use the word “learned” in any article he writes. The man hasn’t learned anything since 1956. But I digress. Unemployment is a terrible scourge across much of the Western world. Almost 14 million Americans are jobless, and millions more are stuck with part-time work or jobs that fail to use their skills. Some European countries have it even worse: 21 percent of Spanish workers are unemployed. This being Krugman, he’s incapable of understanding why the situation is not showing rapid improvement, the failed economic policies of the last few years. I doubt he reads this blog, but just in case he does, I’ll provide a helpful chart. I think I’ve shown this chart before, or a similar one. The red line is the current recession in terms of employment. 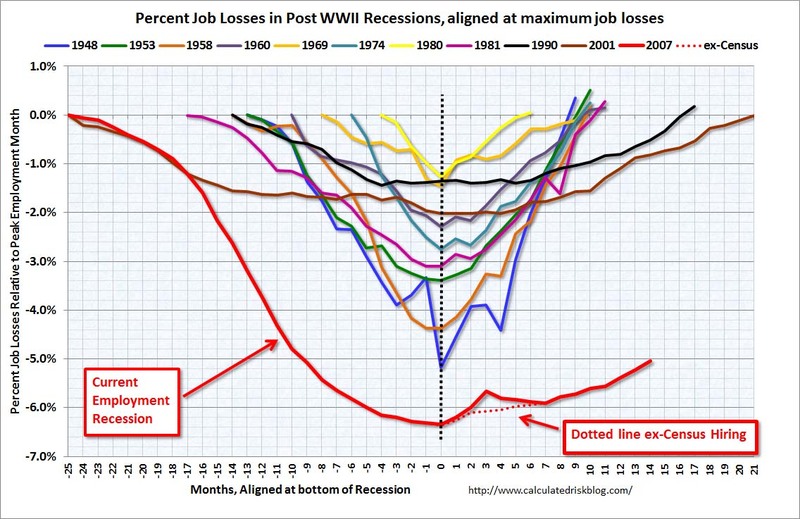 The other lines represent the previous recessions, post WWII. Personally, I would have liked to see the Great Depression on this chart as well, because I think it would be instructive. Anyway, you’ll notice that this recession has been longer and deeper than any other. Well, yeah, kind of figured that part out already. But you should also notice that the recovery rate was much faster after all other deep recessions. Only the very shallow recessions tended to have long recovery, and this isn’t a shallow one. So, why did we recover so much quicker after the other recessions? Because government did the right thing. They created incentives for business to hire and to create products and services, and they got out of the way of business. During this recession, we have done the exact opposite. We haven’t cut taxes. We’ve created huge new burdensome government programs and regulations, and we have the NLRB trying to prevent companies from expanding. Finally, we spent trillions of dollars on political favors which accomplished nothing, but created a crushing public debt load which is also limiting growth. I firmly believe that every single economic decision that President Barack Obama (D-USA) has made has been wrong. He should be channeling George Costanza. If he had, he’d be cruising towards re-election and no one would be talking about the economy. Our President could learn a lot from George. And so could Krugman. Which brings me back to my point. So someone needs to say the obvious: inventing reasons not to put the unemployed back to work is neither wise nor responsible. It is, instead, a grotesque abdication of responsibility. So what did the O.E.C.D. have to say about high unemployment in its member countries? “The room for macroeconomic policies to address these complex challenges is largely exhausted,” declared the organization’s secretary general, who called on countries instead to “go structural” — that is, to focus on long-run reforms that would have little impact on the current employment situation. And how do we know that there’s no room for policies to put the unemployed back to work? The secretary general didn’t say — and the report itself never even suggests possible solutions to the employment crisis. All it does is highlight the risks, as it sees them, of any departure from orthodox policy. Yes, someone needs to state the obvious. Dr. Krugman, you’re an idiot. Using the government to put people back to work is always destined to fail. Where have you been the last few years? It fails for more reasons than I can count, but let’s start with three simple ones. Government programs have long start up times and delayed payouts, and they don’t create demand. The last is the most important. When you allow the private sector to produce, that creates demand for employment, because it creates a produce-spend-consume cycle. Government programs don’t create such cycles unless they’re continually fed with other people’s money. As for how we know that there’s no money to put these people back to work, I present another chart for you. The core of our economic problem is, instead, the debt — mainly mortgage debt — that households ran up during the bubble years of the last decade. Now that the bubble has burst, that debt is acting as a persistent drag on the economy, preventing any real recovery in employment. And once you realize that the overhang of private debt is the problem, you realize that there are a number of things that could be done about it. For example, we could have W.P.A.-type programs putting the unemployed to work doing useful things like repairing roads — which would also, by raising incomes, make it easier for households to pay down debt. We could have a serious program of mortgage modification, reducing the debts of troubled homeowners. We could try to get inflation back up to the 4 percent rate that prevailed during Ronald Reagan’s second term, which would help to reduce the real burden of debt. The W.P.A. was the cornerstone of President Franklin Delano Roosevelt’s (D-USA) policies to end the Great Depression. Most rational economists now realize that FDR’s policies extended the Great Depression, not ended it. What ended the Great Depression was WWII, and in one of Krugman’s few moments of clarity, he even admitted that in 2008. Unsurprisingly, today’s Krugman does not have this clarity. Instead, he wants to try policies that he knows do not work, because his core philosophy is based entirely on Keynesian economics, and introspection is not an option for him. His ego will not allow him to admit that he’s wrong and that Keynesian economics has failed. So, instead he continues to push failed policies, and since he’s the the most favorite living economist, his words matter. His influence matters. And we all pay the price.